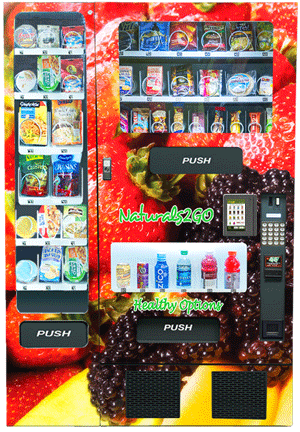 Nutrition2Go offers an extensive selection of healthy snacks and drinks from a single machine. Our company was started for the sole purpose of offering fresh, organic and all-natural snacks and drinks from vending machines. We are not trying to react to the traditional vending industry, we are re-defining it. We are healthy vending operators Nutrition 2 Go, LLCand are passionate about health, nutrition and fitness. Our vending services goal is to offer healthy snacking and beverage options to people on the go. With a current trend towards obesity in adults and children and the overall decline of health due to poor eating choices, we are committed to do something about it. That is why we have choose Naturals 2 Go machines for our crusade. They are attractive and hi-tech. One of the key features is a 7 inch touch screen, where buyers can interact and display nutritional information of any product being offered in our machines. According to a Society of Human Resource Management Poll 97% responded “favorably” or “very favorably” to efforts of promoting wholesome food and drink options at workplace and schools. This is a definite move toward healthier eating in the workplace & schools. We hope you’ll join in our mission to promote healthy living.